LOVE the avatar! My husband is from New England so he was particularly excited at their comeback! WOW! 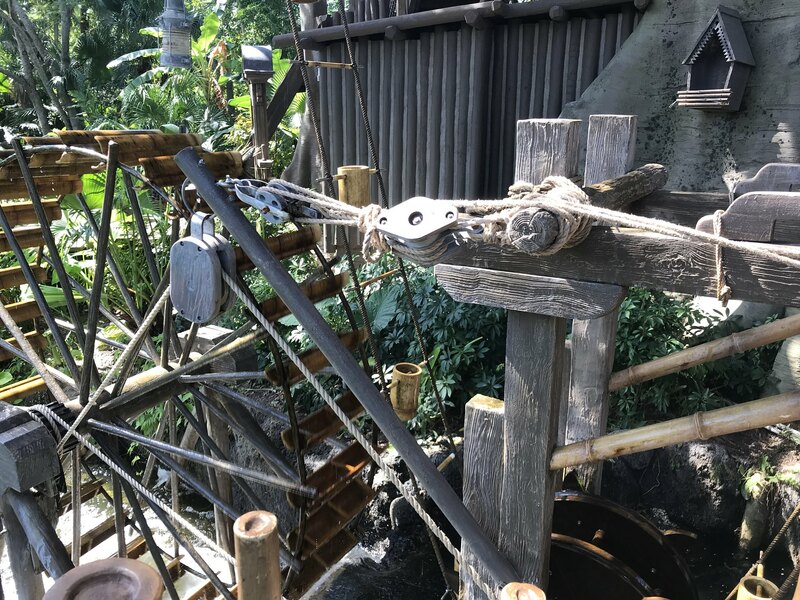 A 5-minute mine train wait!? Lucky! 20 minutes for Space is nothing! You are rocking it! I think I love the PP queue as much as the ride! 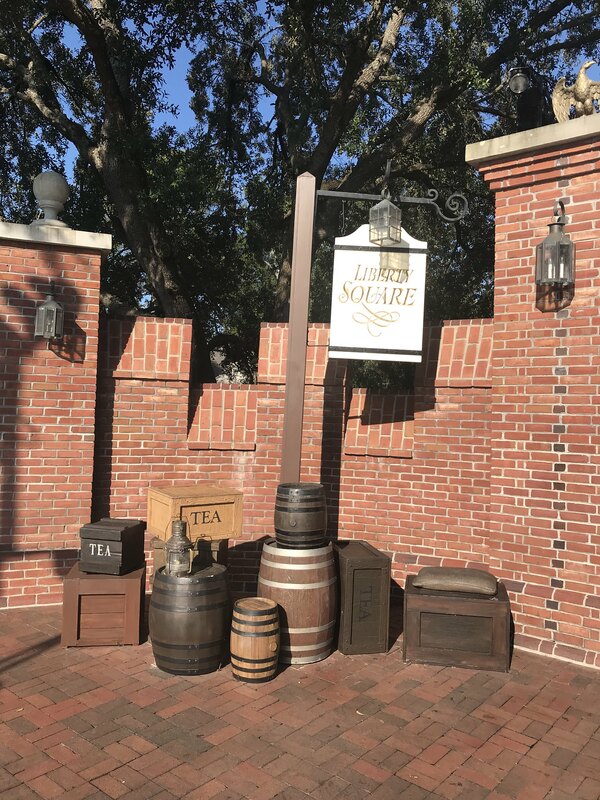 I was finally able to slow down a little and enjoy the beautiful sunshine as I made the trip from Tomorrowland over to Liberty Square. I felt I was doing a good job of knocking things off the list and was lucky the park was pretty quiet. 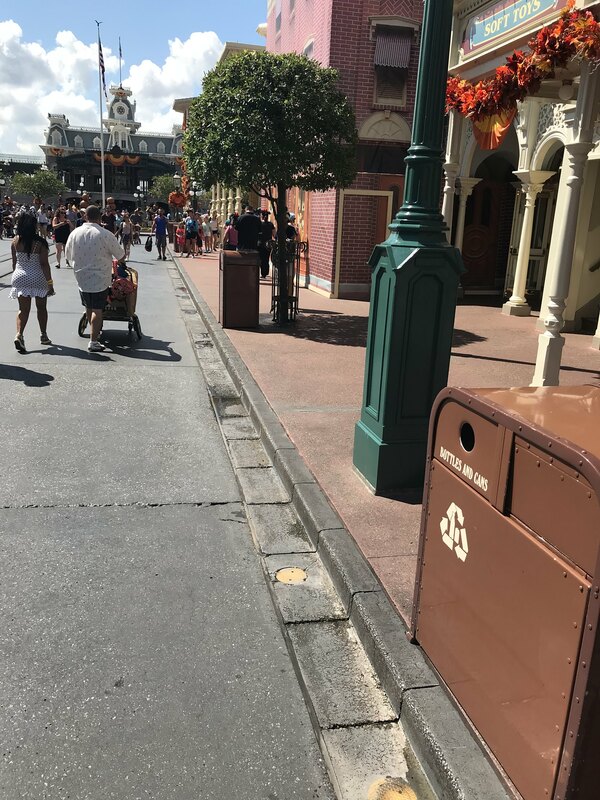 As I wandered through the hub area around the castle I looked back down Main Street and noticed a pretty heavy influx of guests and I was expecting wait times to jump up a little. 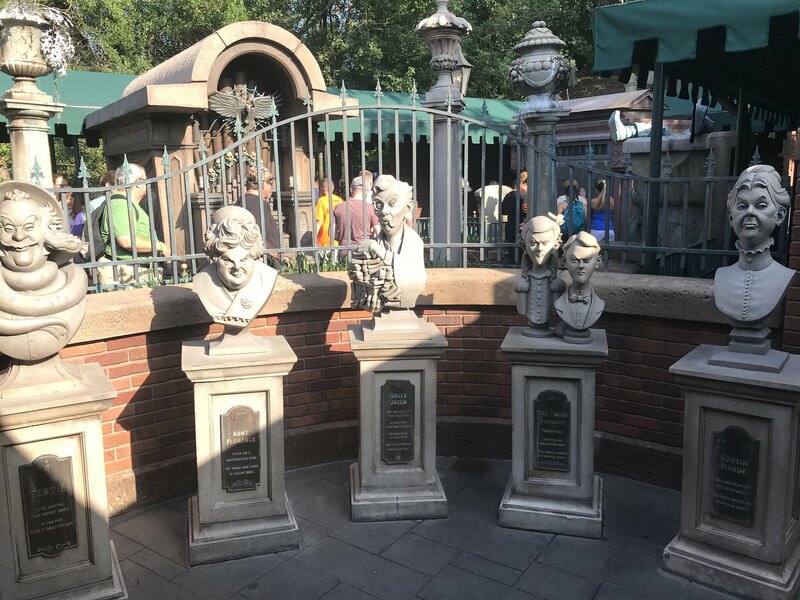 I found myself walking through the Haunted Mansion queue for one more doombuggy trip. 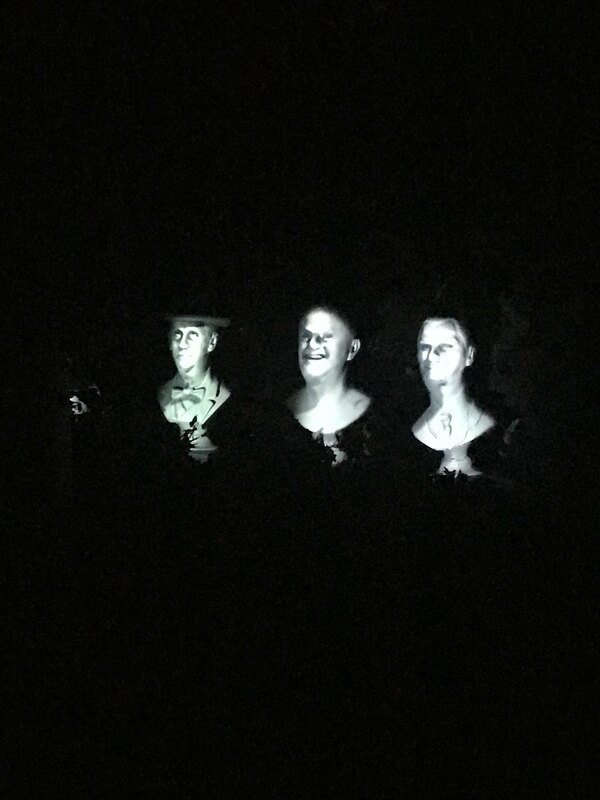 Haunted Mansion continues to amaze me every time I ride. Such brilliant show scenes and a lot of fun to try and pick out new details that you may not have seen in previous rides. 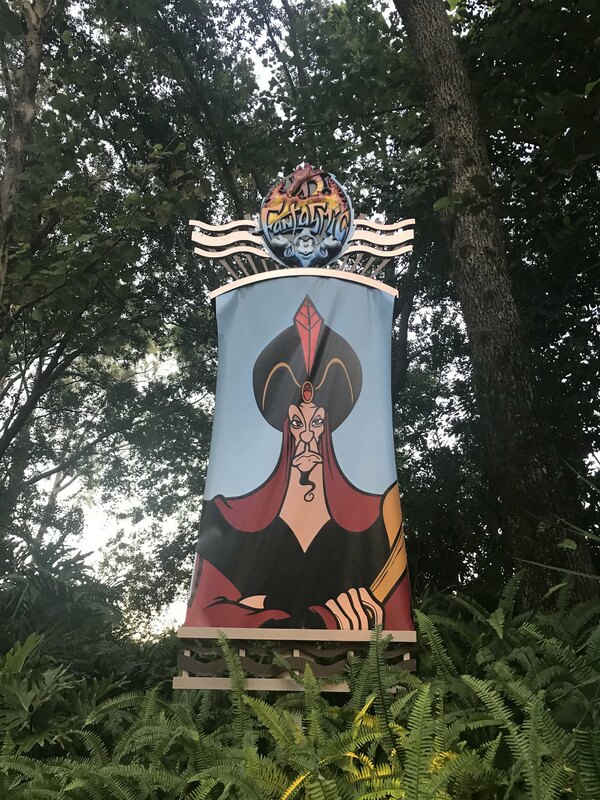 I know the kids are still a little leery of the ride each time we visit so it was nice to roll through without anyone getting too scared before taking a trip with our ghost host. As usual, you can never go wrong with a ride through the mansion! I was very pleased about the way the morning was shaping up and while I had an early lunch reservation at the Plaza creeping up, I still had time to get some stuff done. 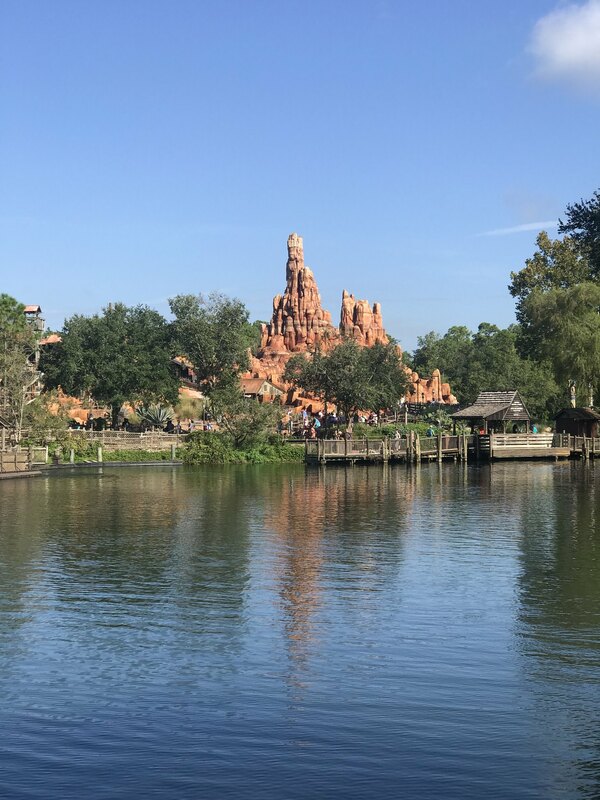 I wandered down by the water towards Frontierland to hit up the remaining two mountains in MK. The wait time for the Wildest Ride in the Wilderness was only 15 minutes and I was more than happy to wait in that line. I noticed Splash was up to about 20 minutes so I figured I would head there next. Couldn’t pass up my all-time favourite. During these last two trips, I really developed a new appreciation for the Big Thunder standby queue. 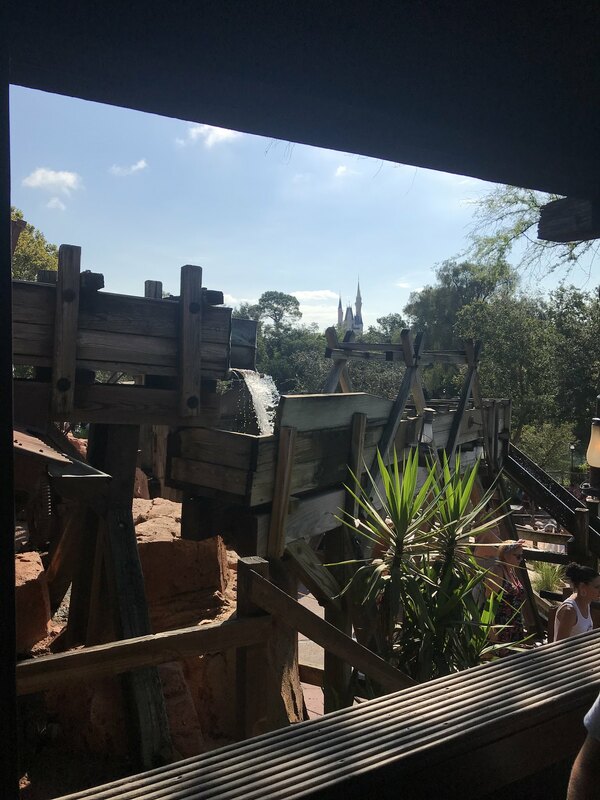 Lots of very cool details and unique views of the rest of the park. The posted wait time was pretty much just right and after 15 minutes I was loaded onto a runaway train and sent out for another thrill. I did miss the screaming that would typically come from all three of the girls (Kelly is definitely the worst) but even without that added bonus the ride was still a blast. I got off and walked over towards Splash only to find the ride had broken down while I was over at Big Thunder. The CMs at the queue wasn’t sure when it would reopen but said to keep tabs on the app. Disappointed, I left Frontierland for Adventureland. 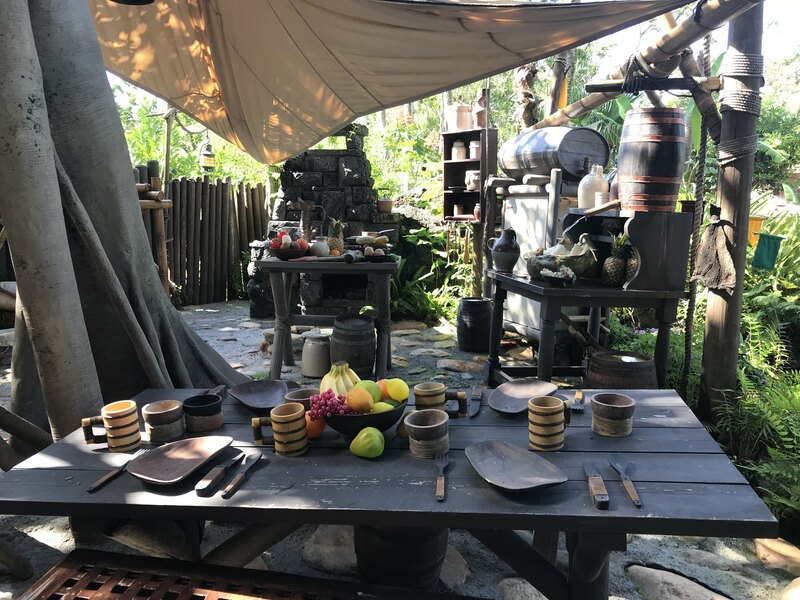 I wanted to ride Pirates once more and was hoping to tour through the Swiss Family Robinson tree house before checking in for lunch. 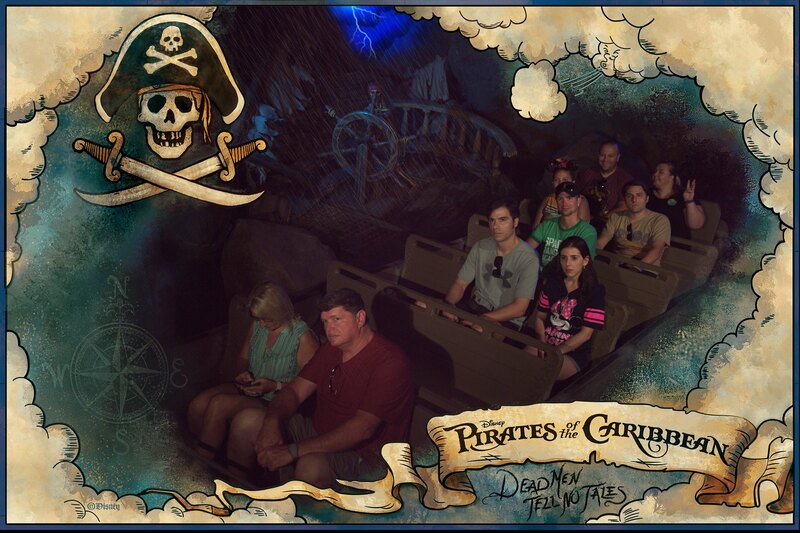 The wait for Pirates was 30 minutes which was fine by me. I wanted to get out of the sun for a bit and still had about 45 minutes before my 1100 am reservation. I sauntered into the line and made my way through the caverns. Surprisingly the line was moving pretty quickly which was great but as I was pretty happy to be in the AC I wasn’t going to be upset if we slowed down along the way. 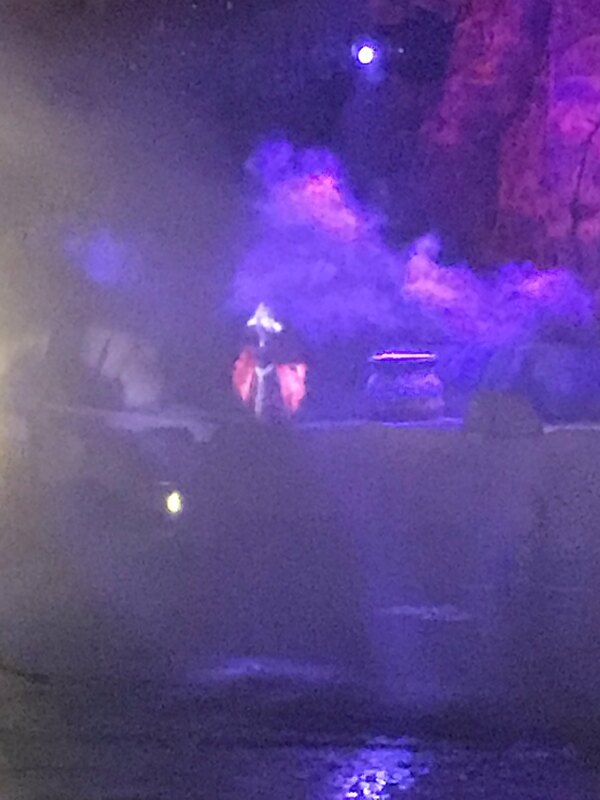 I was kind of missing the live actors from the Halloween Party that would pop up in different areas of the queue but oh well. Before I knew it I was already making my way down to the loading area and soon after we were setting sail on our dangerous journey. I was most pleased to be off my feet for about 10 minutes and I enjoyed my last tour of the Caribbean. I still had more than enough time to rip through the Tree House before heading to the Plaza. I’m fairly sure I have been through the Tree House in the past but for the life of me, I cannot remember it at all. If this was my first look around at least I could check off another first time experience. 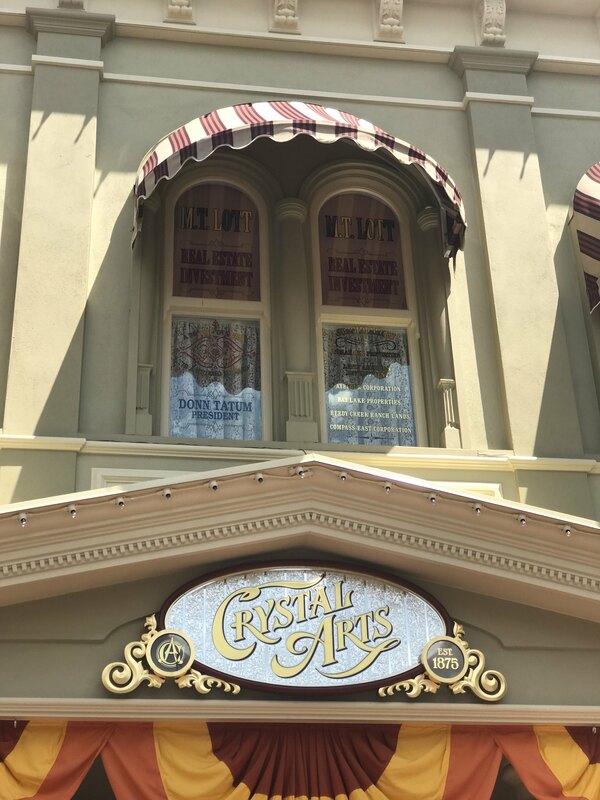 As I wandered around I admired some of the great vantage points of the park along with the intricate details of the attraction itself. Not sure why I haven’t been through here before but I’ll definitely make sure the kids walk through it next time we visit. 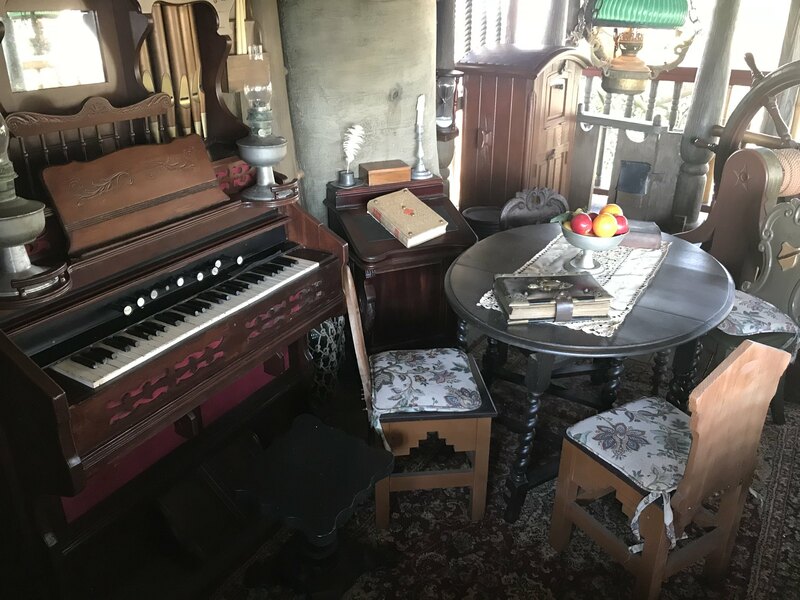 Lots of cool stuff and scenic views! As I left the Tree House it was about 1050, and time to head over to the Plaza for lunch. 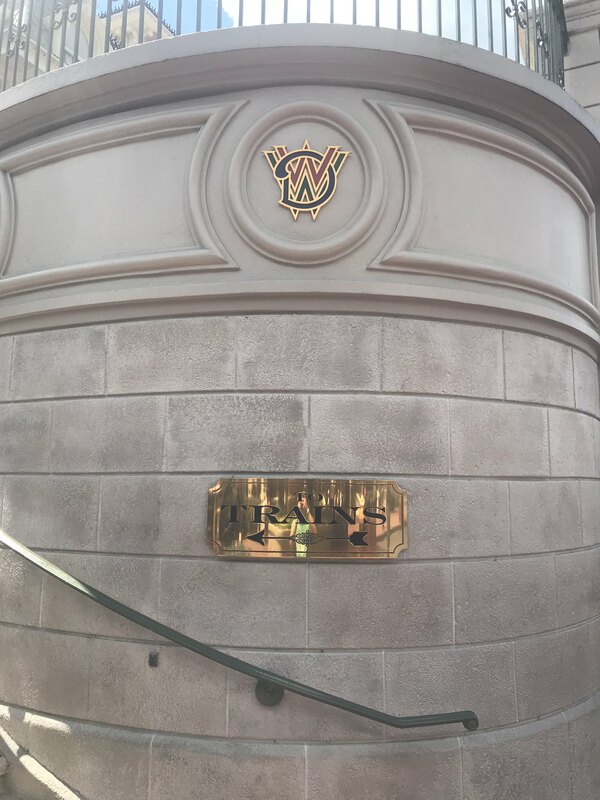 As I was planning my trip the only reservation I was able to score for lunch was an 1100 am and since I love the Plaza I was happy to jump at it. Plus, I had been ripping around pretty nonstop this morning so I had definitely worked up an appetite. I arrived and checked in right at 11. I had a very short wait before my name was called and I was met by a friendly CM to guide me to my table. As she said hello, she also remarked that I must really like the Plaza since I had dined there just a week before. 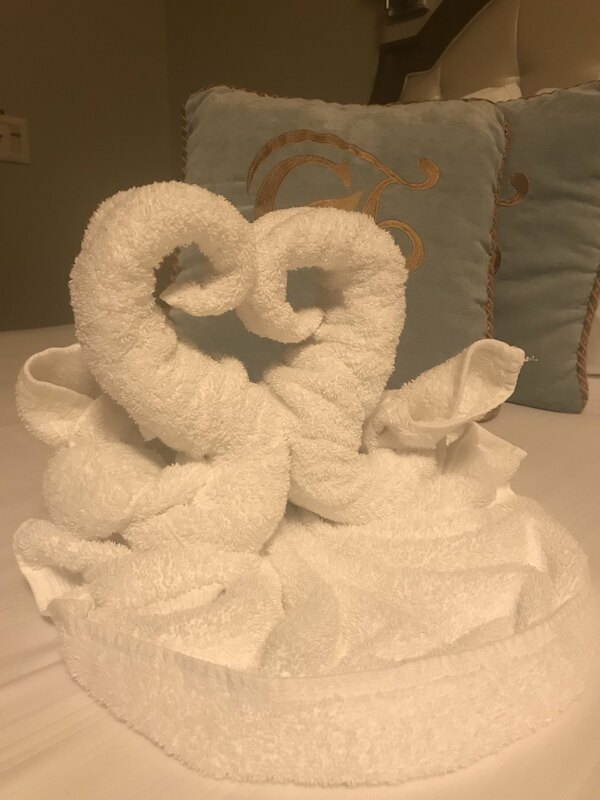 I was both impressed and scared that they have that information at their fingertips but at the same time, having just completed the DI program, I knew this type of tracking of guest information was par for the course. I was seated near the kitchen doors in the main dining area and I was met relatively quickly by my server who introduced herself and took my drink order. 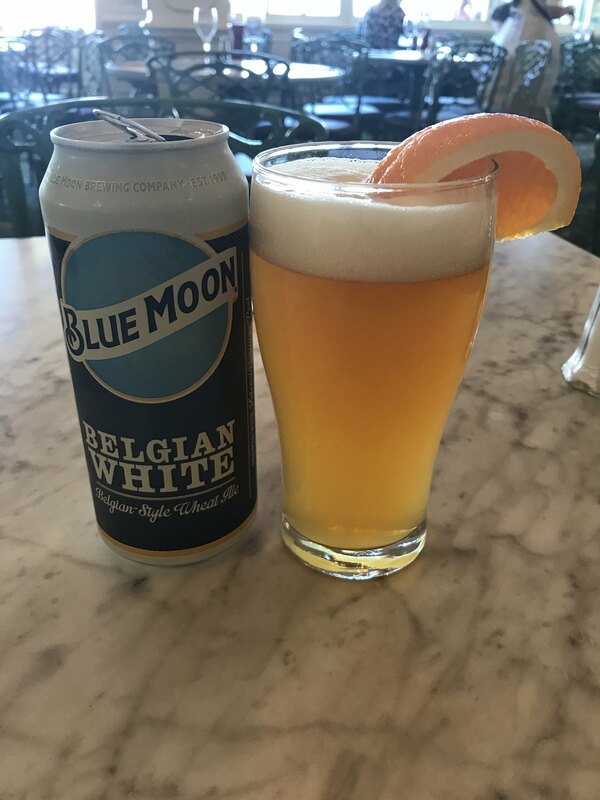 I was tempted to go for another milkshake but decided a cold Blue Moon would better quench my thirst. As I was making up my mind on lunch, the guest beside me, also dining solo, was greeted by the chef who clearly knew who she was as he knew her name and gave her a hug before sitting down to chat with her about her meal. I assumed she has severe food allergies as they were talking about options that the chef could provide. 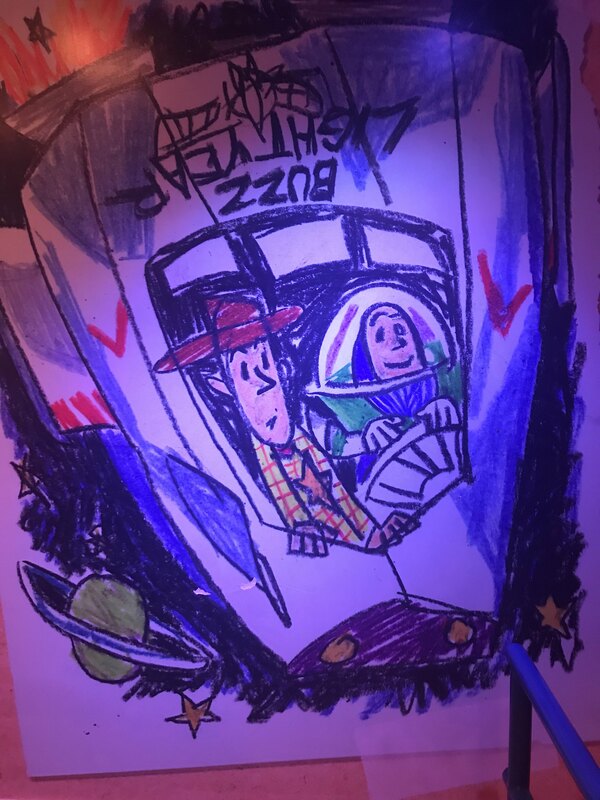 I know this is not rare at restaurants but another cool illustration of the Disney touch with how much attention the chef paid to the guest and how he really went out of his way to ensure she had a good experience. As for my meal, I decided to order the BBQ brisket Macaroni though the fried green tomato sandwich was calling my name again. I’ve sampled enough of Kelly’s orders in the past to know the meal was going to be very good and I was not disappointed. It was terrific, as always. Just hammered home that the Plaza is hands down my favourite lunch spot in WDW. As I was finishing my meal I made sure to check the app to find out the status of Splash and I was happy to see it was up and running again. The posted time on the app was 40 minutes so I made sure to square up for my meal, thank my server and high tail it over to Splash. When I arrived the wait time jumped up to 55 minutes but since it was still only about 1145 and Splash is my fave, I was willing to wait. Into the line I went. Unlike Pirates that moved super quickly. This line was at a crawl. Barely moving for extended periods at a time and the sun was beating me up! By the time I finally made it to the stairs to climb up into the building, the 55 minute wait time had come and gone. I literally had nothing better to do so I was fine with waiting it out. After about 70 minutes I had finally reached the loading dock and was hoping I might get seated somewhere close to the front to get cooled down. Alas, no dice…to the back I went. 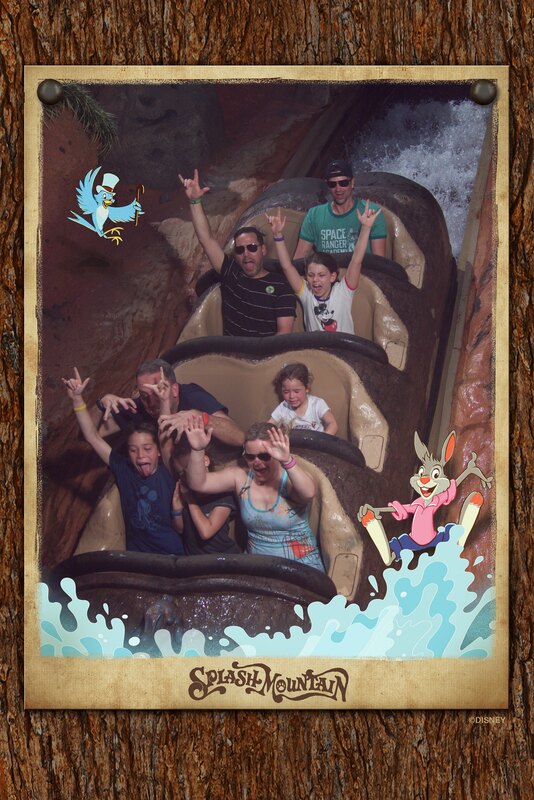 I’ve been on Splash more times than I can remember but I was so glad I waited to ride it one more time this trip. It’s a classic and will always be at the top of my list. Sadly I didn’t get cooled down with a big splash but it was still great. With Splash now checked off the list, I decided I should head back to the hotel and do some packing. My evening would be spent at Hollywood Studios and I was going to be getting up super early to catch my 700 am flight the next morning. The more I could get ready at this point in the day, the better. 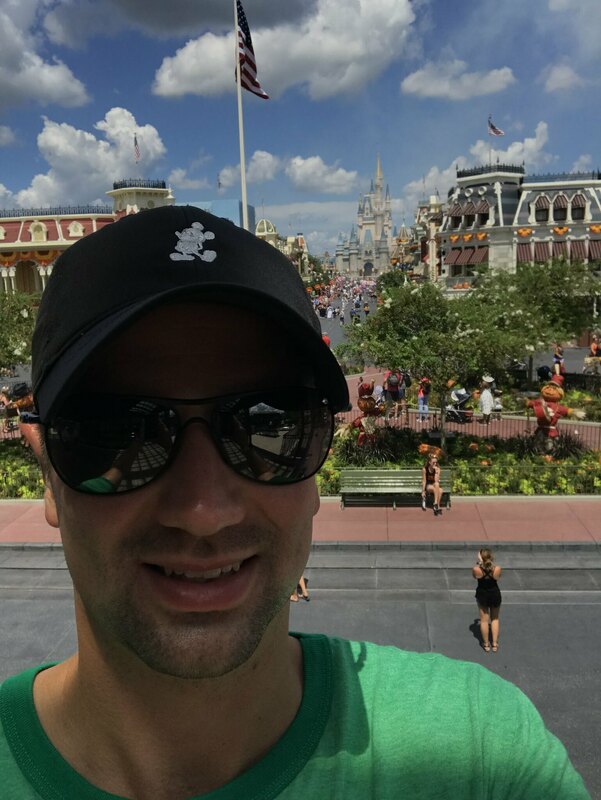 As I walked towards the park exit, I slowly strolled down Main Street one last time, taking some parting photos, including one last selfie from the train station deck. 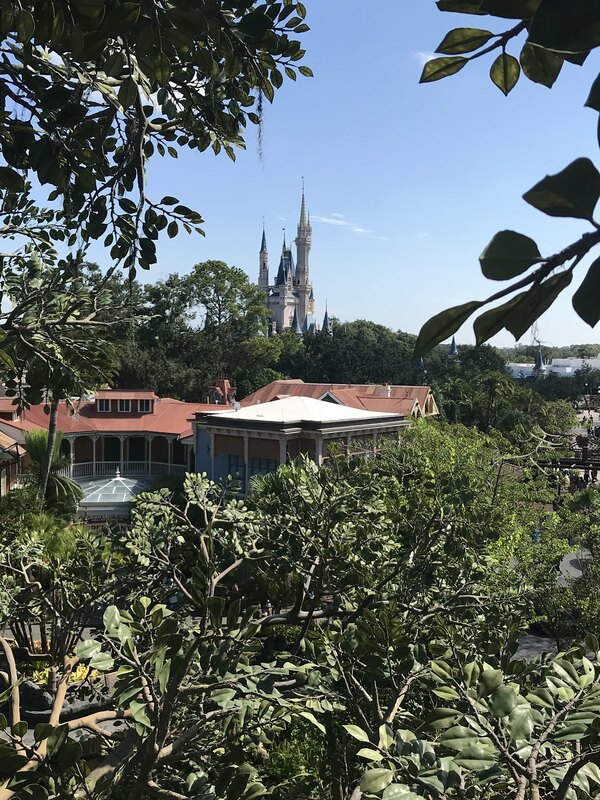 With that, I took one last look down at the castle and soaked it all in before walking through the exit and heading toward the resort launch to grab the boat back to the Grand. As I was sitting on the boat I was thinking about my morning and how I accomplished pretty much everything I set out to do. It was still early afternoon and probably could have done more but I was happy with my final MK visit and even happier to walk into my room and cool off! As I arrived back at the Grand I decided to stop in at Gasparilla’s and grab a cold beer to take back to the room. It was scorching hot and I had already racked up some 10,000 steps. The beer would be a welcome treat as I packed up my stuff and readied myself of the trip home in the morning. With a cold Coors in hand, I went back to the room to start folding up and packing my suitcase. Much of which was already done the day before but I spent the next little while trying to figure out how to pack my usual stash. I was beyond pleased to have stocked up on this trip after bringing back only a couple of bars of soap and a few body lotions during our French Quarter stay. The only thing that disappointed me was the mint foot rub was never replaced, even though I took every measure I could to hide the original bottle in hopes they would replace it daily. No dice. But at least I have bought the larger version from the gift shop to take back home with me. And I’m glad I did as I continue to run more and more frequently. It’s been a foot saver! With my bag packed and my clothes for the trip home hanging in the closet, I was happy to take a load off and watch a little tv before making my way over to DHS. I had planned all of my FP+ for that evening and I still had a few hours before the first window opened up. I debated on heading to the pool but opted not to since I didn’t want to deal with a wet bathing suit in my luggage. The bed and the beer was a fine second choice. After a short rest, I was re-energized and ready for more fun in the sun. I made the walk from my room to the bus stop to wait for a ride to DHS. I was the only person waiting and shortly after I arrived a bus pulled up to take me over to the park. It was still a glorious day outside and it felt even hotter by the time I jumped off the bus to make the long walk to from the bus area to the main gates. It was still a nice bonus to simply walk right through the no bag line and scan my band to enter the park. It looked relatively busy but I had plenty of time and some solid FP+’s to ensure I accomplished everything I wanted to experience. 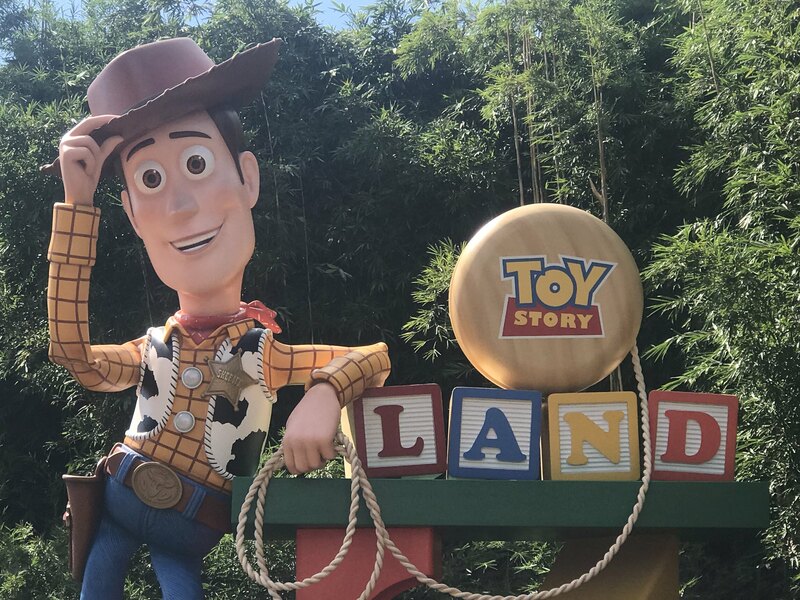 First stop would be Toy Story Land for a solo rip on Toy Story Mania and my first FP on Slinky. Standby time to TSM was only 25 minutes, which was surprising to me knowing how busy this ride usually gets. I wasn’t about to complain and I made my way into the building. The line moved quite steadily for the most part and I was surprised to find that Potato Head was curtained off again as he was during one of our visits on the family trip. Yet again I failed to take a photo of his body without the arms attached. 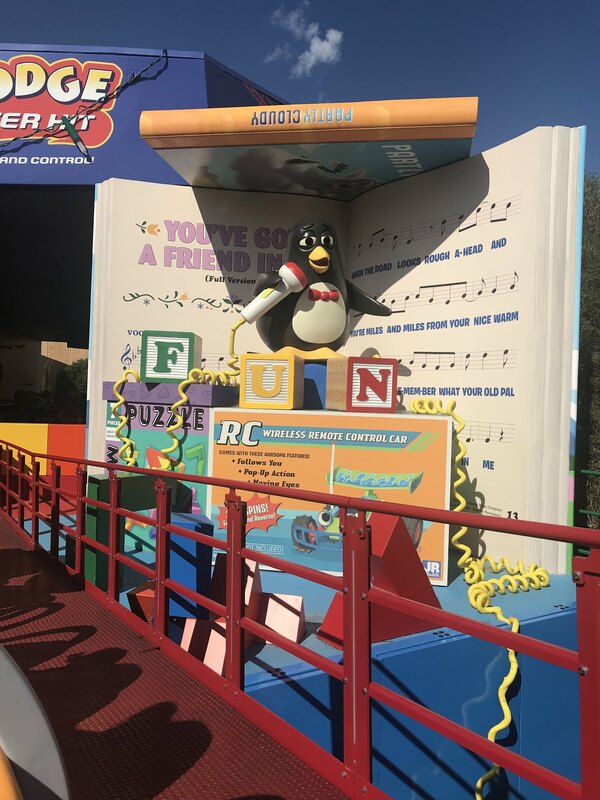 I was loaded onto the ride after about 20 minutes and was hoping I could put up one of my higher scores not having to compete against anyone else. 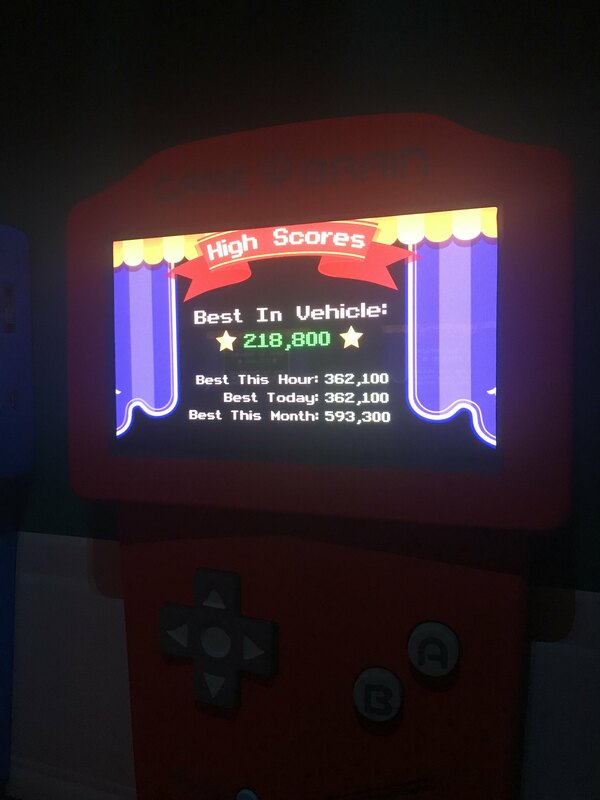 Even by myself, the ride is a blast and as nice as it was not having anyone else trying to steal points, I missed the competition! I finished with a solid score but was kinda kicking myself it wasn’t better! Still undefeated family champ though. From there, my window for Slinky had opened up so that was the next stop. 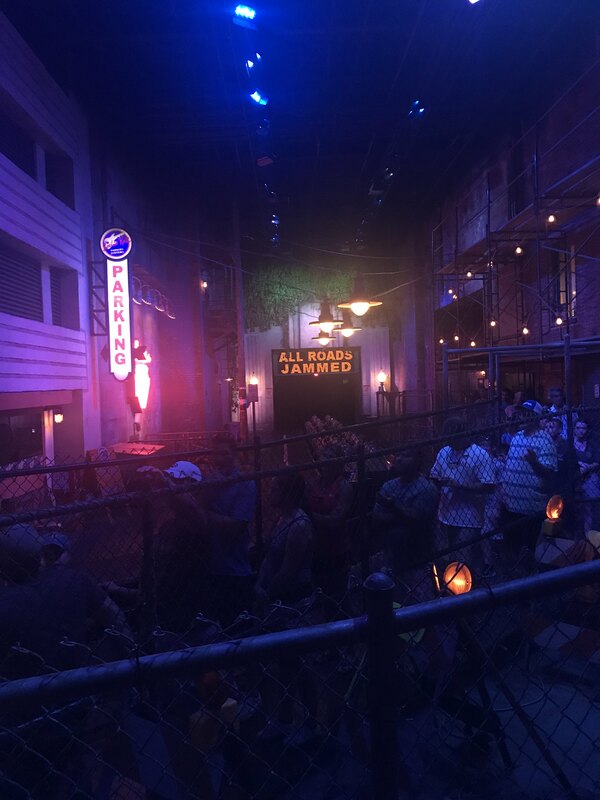 This was supposed to be my first experience with the new coaster but the change of plans from a few weeks early gave me that sneak peek of what to expect. I was looking forward to riding it once more. I rolled through the FP line and was pretty much on deck for being loaded. I ended up chatting with a mom who was with her two young children. 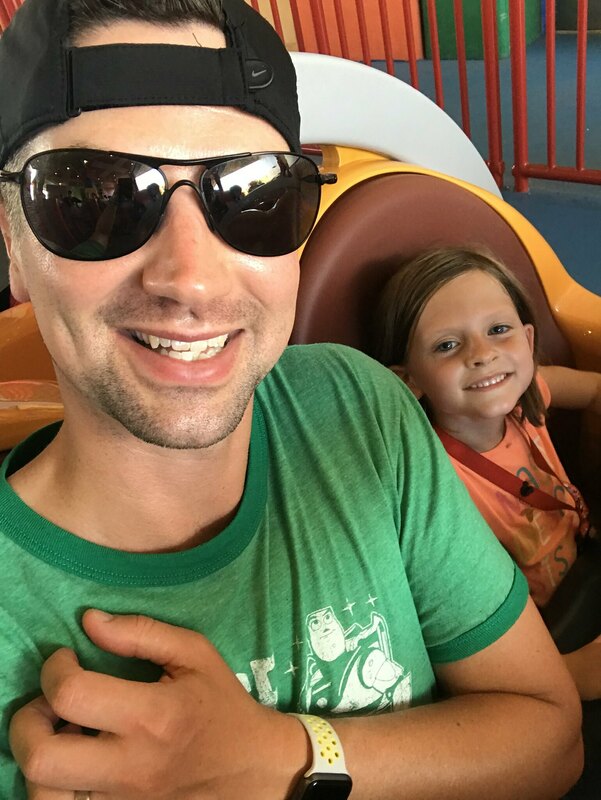 Turned out her daughter was just shy of being able to ride by herself so she asked if I would join their group so I could ride with the daughter and the mom could sit with the younger brother. I was happy to oblige and before long me and my new ride partner, Olivia (at least I think it was Olivia…I may have to edit this later! ), were ready to roll. 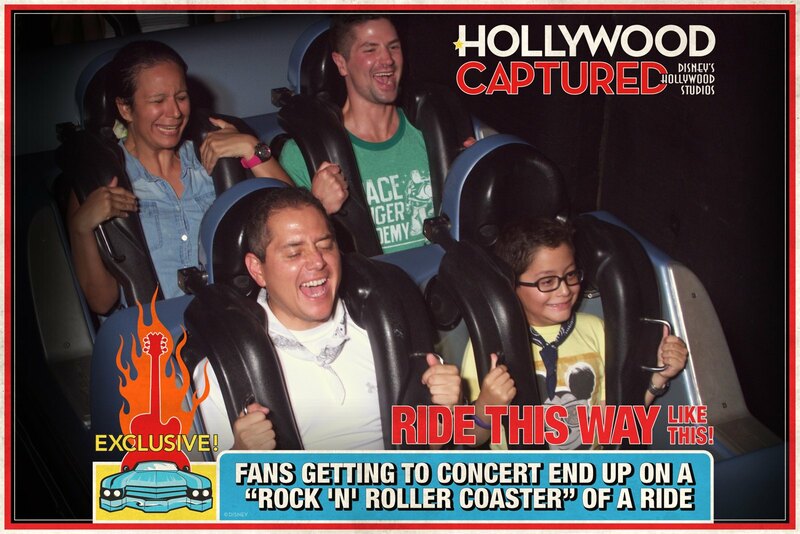 She was raving about how much fun the ride is and how she couldn’t wait for us to take off. We sped off down the track and she was quick to put her hands up and scream the whole way around. We had a lot of fun and she was pointing out everything she saw as we hit different areas of the track. We finished up and she was singing along with Wheezy at the end. I gave her a high five after we unloaded and the mom thanked me for helping them out. If it were anywhere other than Disney I would have been a little leery of the whole situation and likely wouldn’t have done the same if I were in her shoes but I think everything turned out just fine! 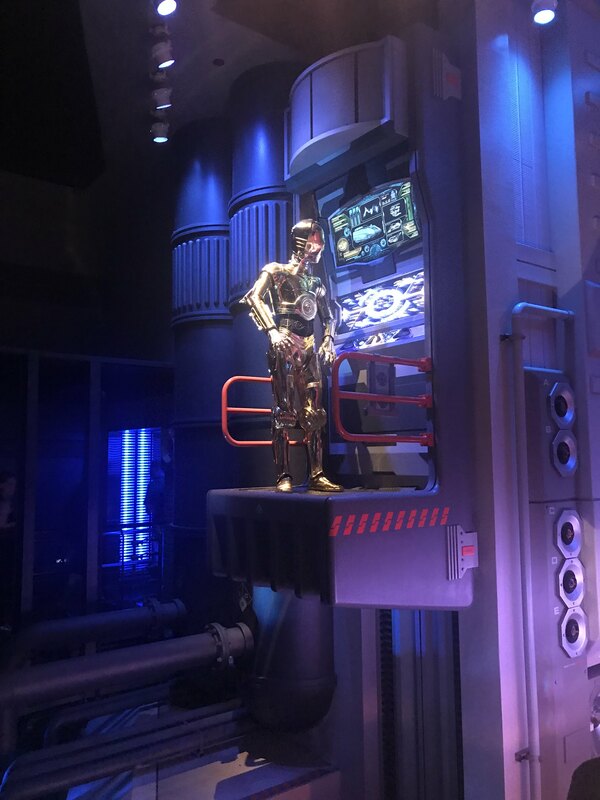 With my trip to Toy Story Land in the books, I wanted to wander over to ride Star Tours. 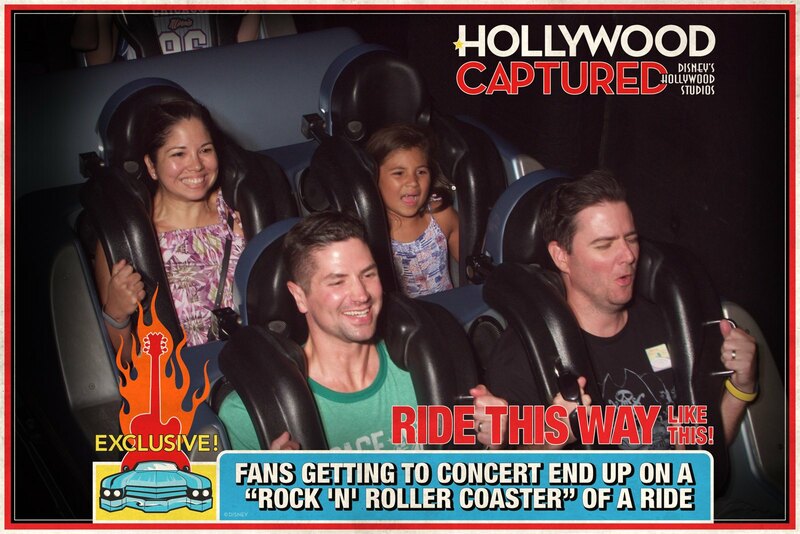 Kelly is not a fan and nor are the girls so I rarely get to jump on this ride when we visit as a family. No better chance than now to get the chance to ride again. As I walked toward Star Wars I passed by the theatre. I miss the Great Movie Ride but definitely look forward to their new creation! This looks like it will be fun. Before jumping on Star Tours, which was only a five-minute wait, I decided to grab a beer and cool off quickly. Yes, this was a trend on this day but hey, it was my last day in the parks so why not enjoy it? With a beer in hand, I found a seat on a bench outside of Star Tours and took some time to people watch while I drank. There is always an interesting, eclectic mix of people visiting Disney so it was fun to sit back and watch. I would have stayed longer but with the heat, the beer didn’t last long at all! 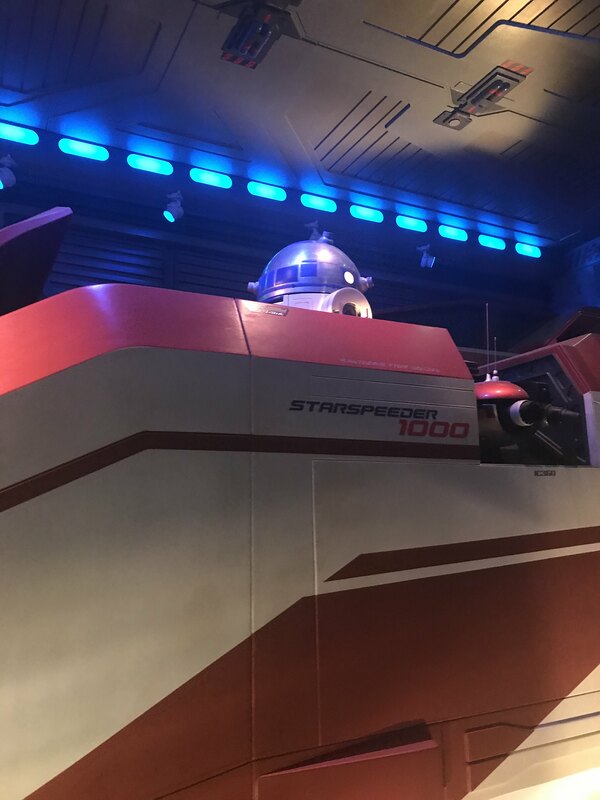 I tossed the cup and walked into the Star Tours queue. Ready to take flight and hoping I might be selected as the spy! Alas, I was not the rebel spy but the ride was fun nonetheless. Our vehicle may have been a quarter full and I forgot just how raucous the ride can get. Almost made me regret that pre-ride beer but I managed to keep things in check. 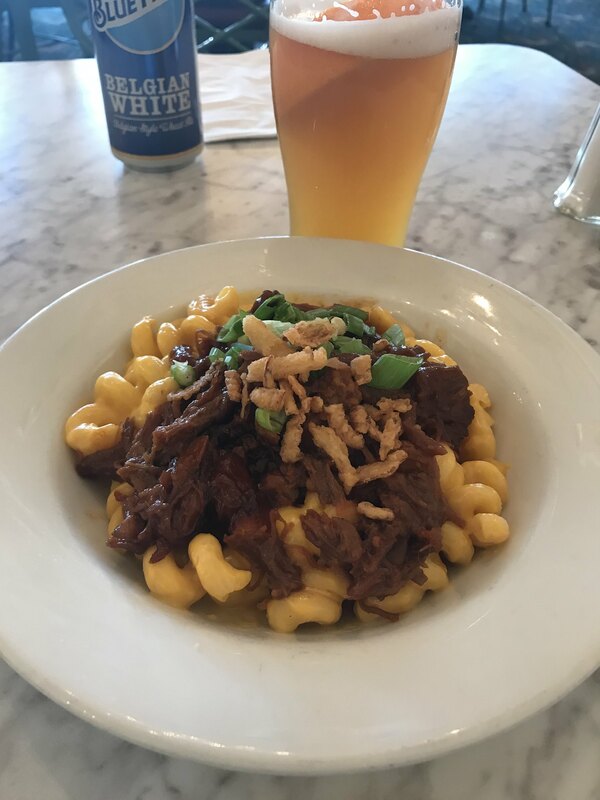 After the ride I was considering heading down sunset for my next FP as my window for Tower of Terror had just opened but instead, I convinced myself to stop at Baseline Tap House to check it out for the first time. Ever since this place opened up, Kelly and I have been talking about how we want to stop in but we didn’t get the chance during the previous week so I thought I could try it and report back to her. 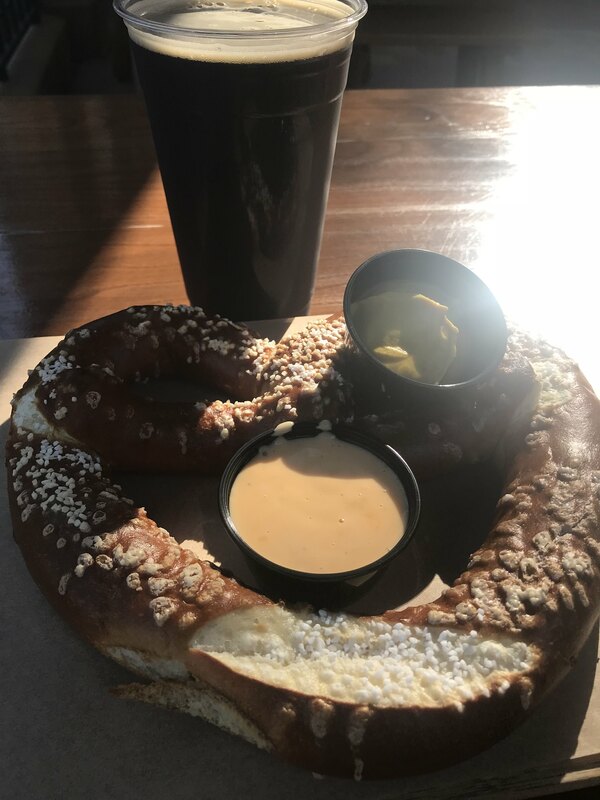 I was a tad hungry so I ended up ordering the Bavarian pretzel and yet another beer, the Ballast Point Black Marlin Porter. I found a table outside with a mix of sun and shade where I could hang out for a bit and enjoy the snack while still getting a chance to check things out around me. The Pretzel was really good as was the beer, though in hindsight I likely should have gone with something a little lighter simply because of how hot it was outside. I wasn’t the only one feeling the heat, a guest sitting around the circular table behind me passed out and fell off her chair. It was a pretty scary situation that was handled very well by the CMs. Thankfully the woman was ok but it looked like it could have been much worse. It was not alcohol related but the heat definitely got to her. With the commotion now cleared out and my beer and pretzel devoured, I was ready to head over to Sunset for back to back FP+’s on ToT and Rockin Roller Coaster. My busy day continued! With the sun slowly starting to set I made my way through the park towards Sunset Boulevard and two of my favourite rides on property. Since these we likely to be the final two rides of my trip I was pretty happy that I saved a couple of classics for last. First up was an FP for RRC that was creeping very close to closing. I made it to the queue with a few minutes to spare, scanned my band and made my way up the ramp to the building. I was ushered into the line for the pre-show relatively quickly and found myself staring at the boys from Aerosmith as I tried to find my way closer to the doors to the loading area. Once inside the ride building, the line to load stretched back to the theatre doors but luckily moved pretty quickly. It felt like I had experienced this ride a ton over the last couple weeks but was still looking forward to feeling that initial surge of adrenaline when you take off. I may have thought about my belly full of pretzel and beer but it was soon an afterthought. I was loaded into one of the middle rows along with another rider from the single line and we soon were waiting for the green light. The combination of the crazy fast start right into a loop is awesome! I love this ride and can’t wait until the girls are tall enough and brave enough to give it a try with us. 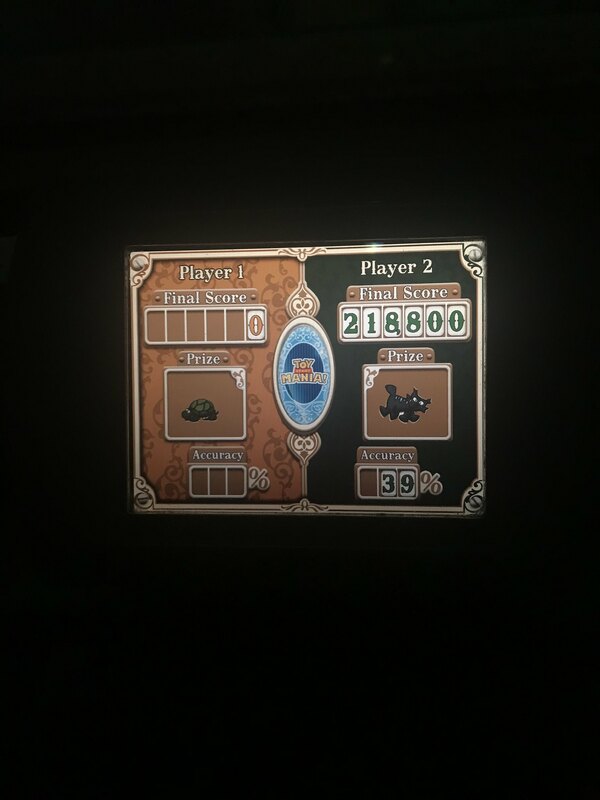 And since I felt like I'd have time to pull off another spin through the single-rider line before the end of my ToT FP window, that's exactly what I did! 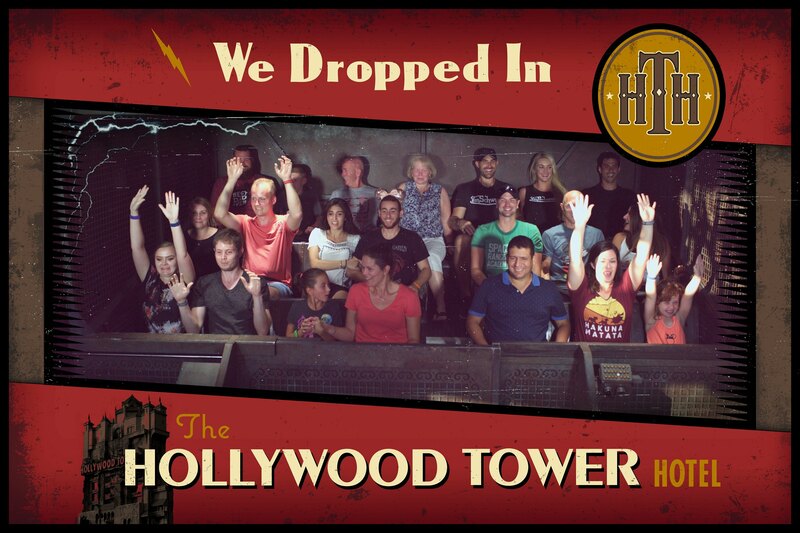 With that ride down, I had one remaining, my final FP for Tower of Terror. With the way the sun was setting it made for a great mood setter as I walked up to scan my band and head towards the library. It didn’t take long before I was watching the Twilight Zone on TV and listening to other guests’ recite the lines! 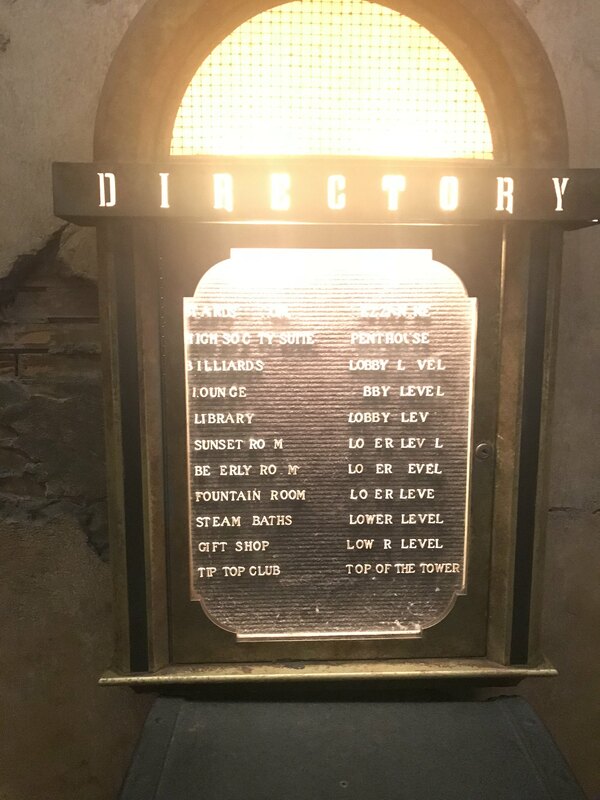 We funnelled out of the library and out towards the elevators. 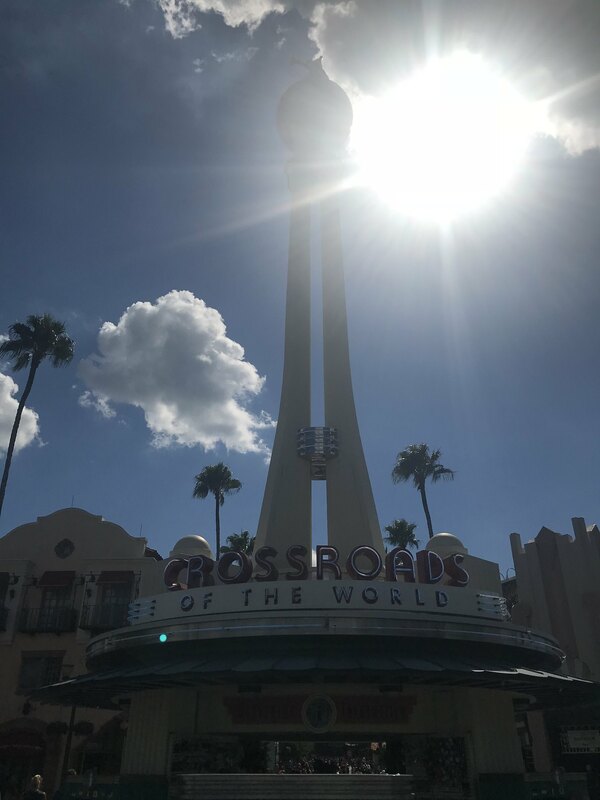 I was looking forward to dropping in one last time and getting that cool view of the park from the top of the elevator shaft. 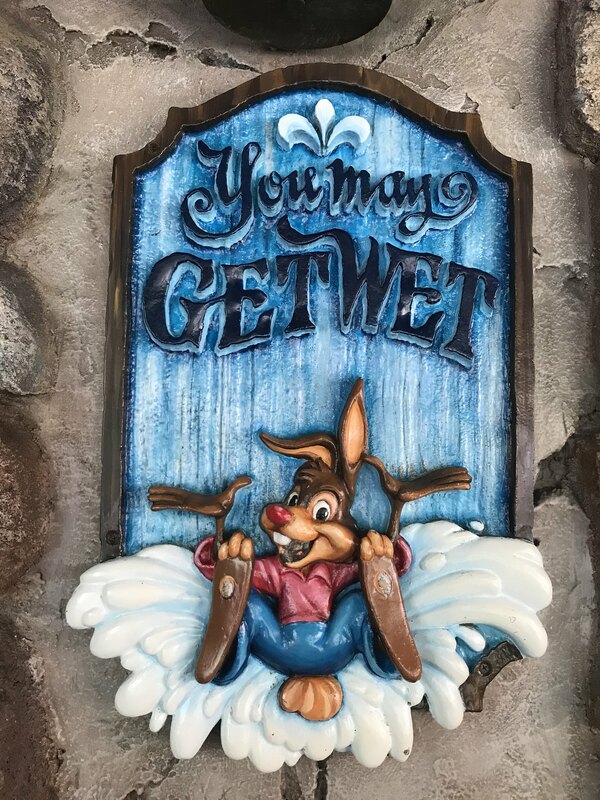 I have yet to ride Disneyland’s new Guardians of the Galaxy ride at DCA and even though the WDW version is much better, I’ll miss the old ToT backdrop whenever we end up paying another visit to Disneyland. 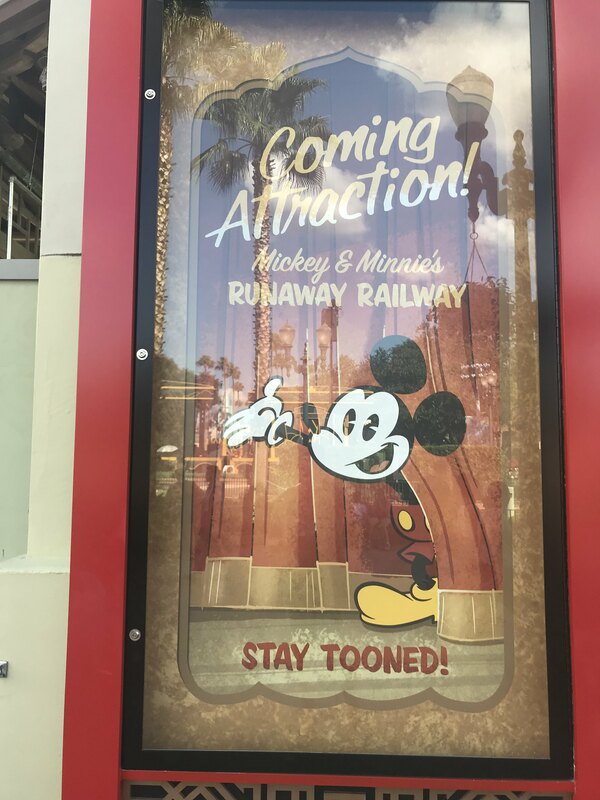 As usual, ToT didn’t disappoint and as I left the ride building I felt pretty satisfied with the day of attractions I had just accomplished. 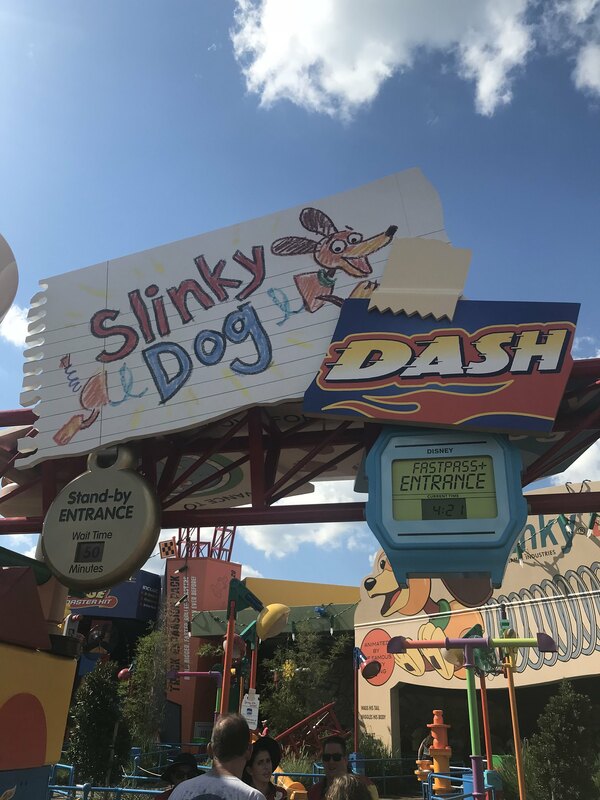 I was thinking of maybe looking to go back to Toy Story Land and either ride TSM or maybe the aliens but I instead decided to walk over to Mama Melrose to see if I might be able to get in a little early for my dinner reservation. 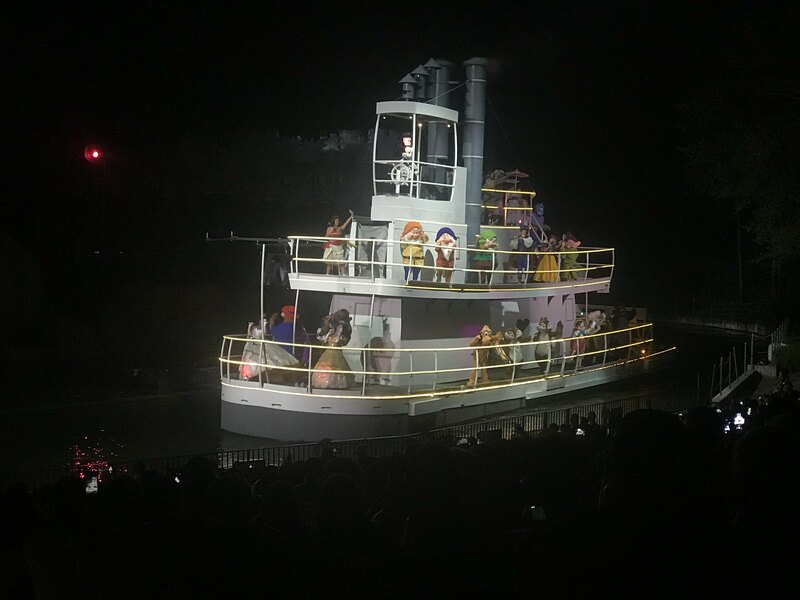 Earlier in the week I was trying to change the reservation time to something earlier as I really wanted to watch Fantasmic before heading back to the hotel but I couldn’t find anything earlier than 645. I was hoping maybe I’d get lucky and be seated a little early so I could still have plenty of time to find a decent seat before the show started. Sadly, the lineup of people out the door dashed those plans pretty quickly. 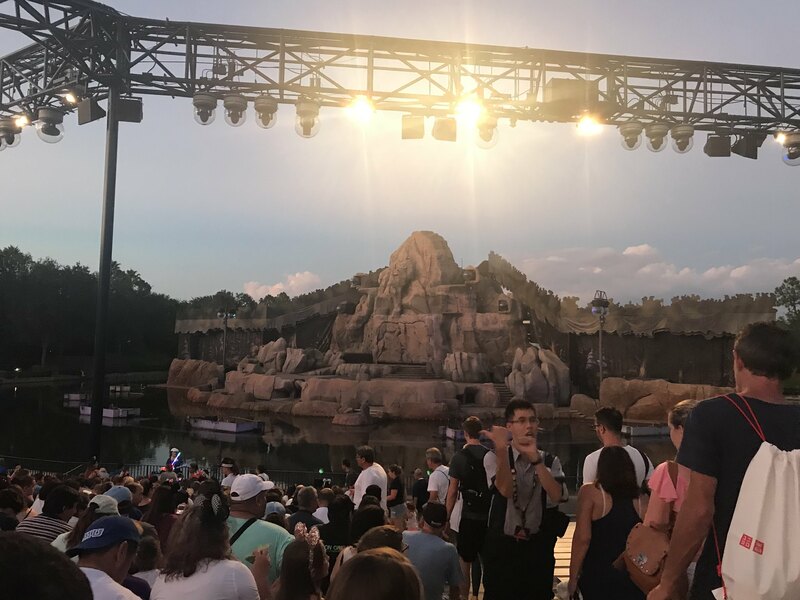 As I checked in I was told the restaurant was at least 30 minutes behind and since I was 30 minutes early There was no way I’d be seated for another hour, which would have meant missing Fantasmic altogether. 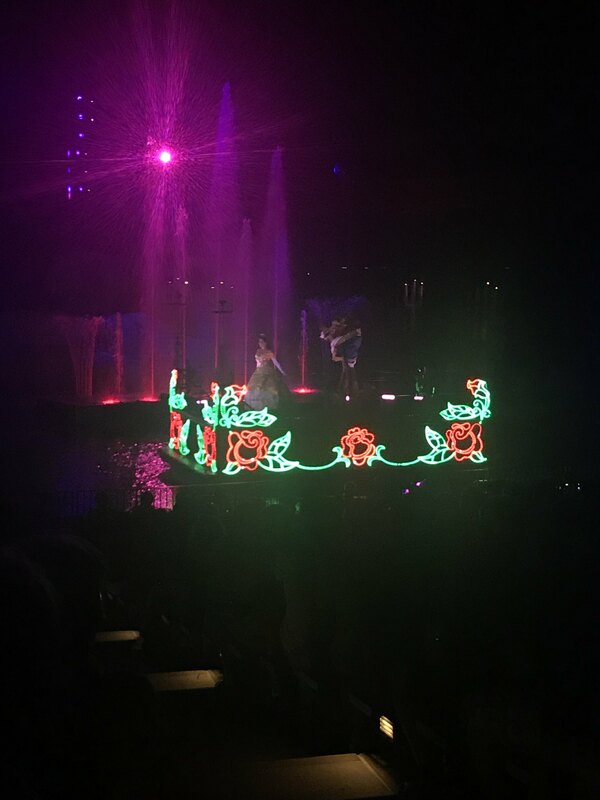 The CM apologized and allowed me to cancel my reservation which was fine with me as I was still pretty full from Baseline and really didn’t want to miss the show. 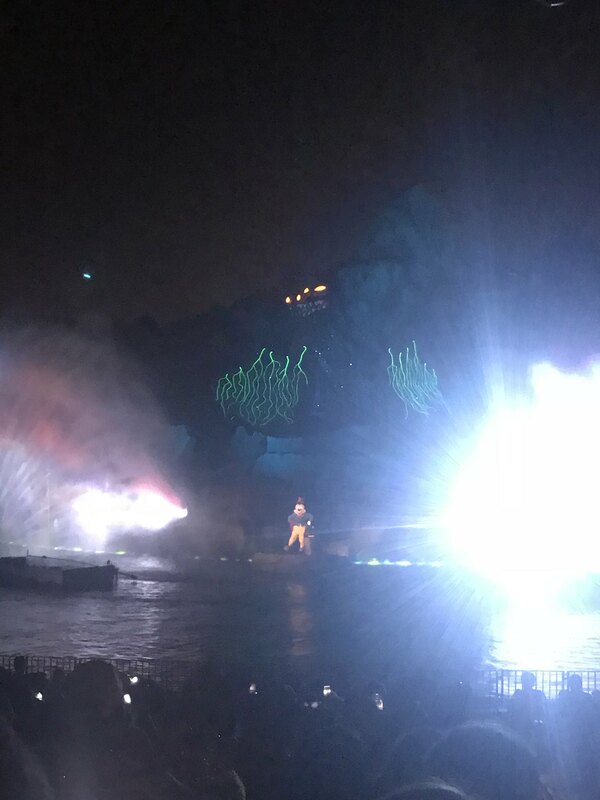 With that I set off yet again to the opposite side of the park to get a good spot for Fantasmic. It had been years, at least a decade, since the last time I watched this show and I was pretty excited to relive it. I may have been quite early upon arriving but I certainly wasn’t the only one. The theatre was already at least a quarter full and hoards of people were arriving behind me. I found a good seat about 6 rows from the top just off to the right of centre. I hunkered in and FaceTimed the girls back home to kill a little time before the show started. 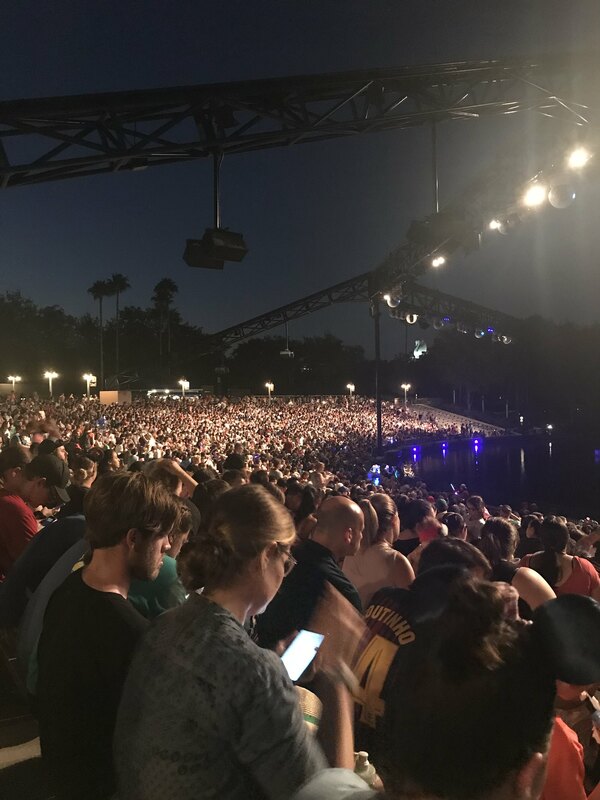 As I looked around more and more people were taking up the empty spaces and by the time the show was about 15 minutes from starting it looked like every available space was filled. Somehow, I was not surprised at all that a family of five tried to sneak in right beside me just as the show was about to start. I politely, yet firmly, stated that I had been in this spot for over an hour and I was not moving. Nor was there room for five of them to sit. They seemed stunned but eventually retreated to the top of the stands to look for more seating. Usually I’m not one for confrontation but in this case, I wasn’t letting this fly! 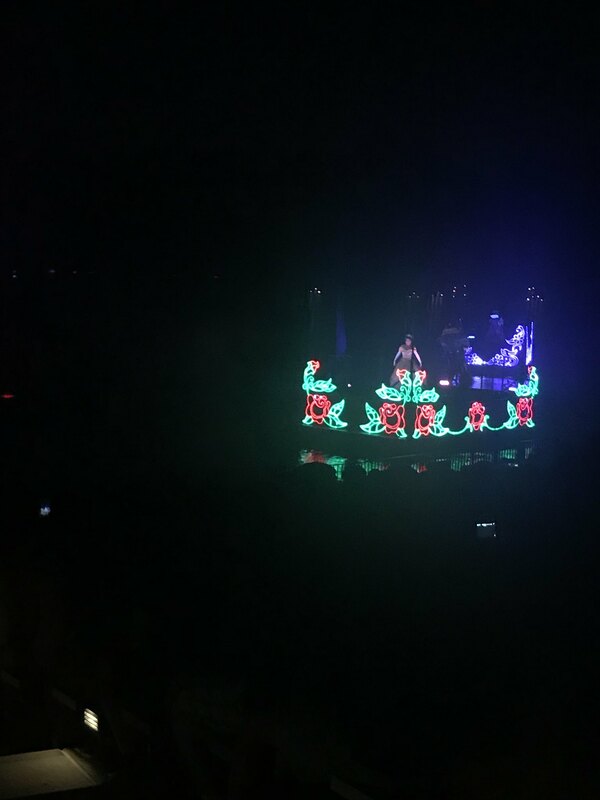 With that, the show began! I forgot how much I enjoyed the show and just how different it was, the whole theatre and all, from the DL version. 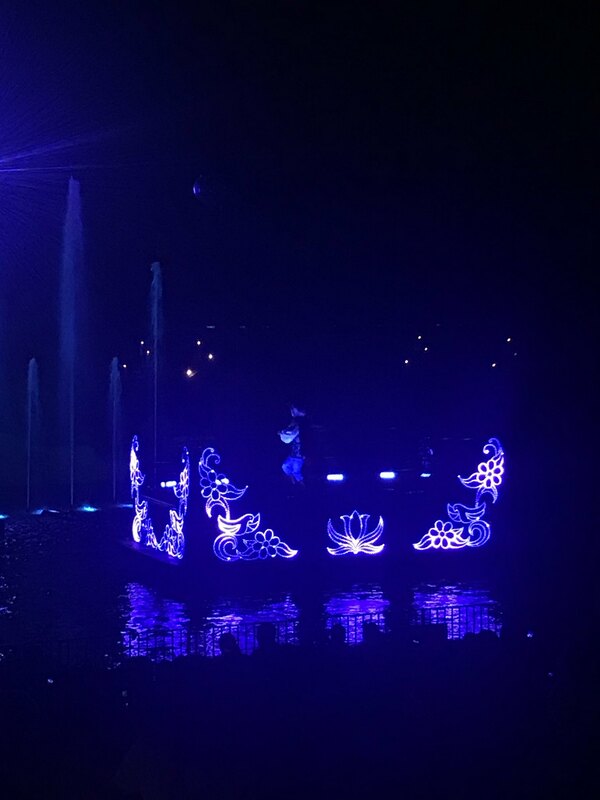 Even with the long, somewhat lonely wait, it was well worth it and a pretty perfect way to close out the night and the last of my park visits. I will admit I left just before it ended so as to avoid the sea of people all leaving the theatre at the same time and to get a head start on the walk back to the bus. They had opened up an overflow exit from just outside the theatre that leads right to the main gates. It was perfect as the fireworks were just beginning and the main streets were packed with onlookers. I left the park and walked back to the bus while fireworks explode overhead. Seemed like an appropriate way to wrap up what was an amazing trip and as I was trying to soak up every last second, I was also thinking ahead to my 330 am wake up call to start getting ready to head back home and reunite with the girls. The bus ride back to the Grand was pretty subdued, and my final walk from the bus stop back to my room at Sago Cay was a bit of a sad one. All the action had now come to an end and it was time to focus on getting a little sleep before heading back to the airport. And wouldn't you know, one last touch of Disney magic welcomed me back to the room for one final night. As I was getting ready to head out to the Magic Kingdom the day before, I noticed my DME notice hanging on my door. I looked at it in horror to see that the bus would be arriving to pick me up at 300 am the next morning. My flight, which would take me to Toronto first, was scheduled to leave at 700 and I was not excited to be heading to the airport four hours in advance. Instead, I ended up scheduling a Lyft to pick me up at 400am so I could get a little extra sleep. I probably didn’t fall asleep until after 11 and I knew that alarm would be going off soon. When it did I was in sad to be leaving but excited to be heading home to my girls. I quickly showered, got dressed and packed up the last remaining loose items before taking one last look around the room and heading towards the main foyer or my ride. I stopped at Gasparilla’s to fill up my resort mug with my first cup of coffee. The restaurant was dead silent with the exception of a few CMs cleaning up and getting things ready for the morning. With my mug filled I lugged my bags to the main area and waited for my Lyft. 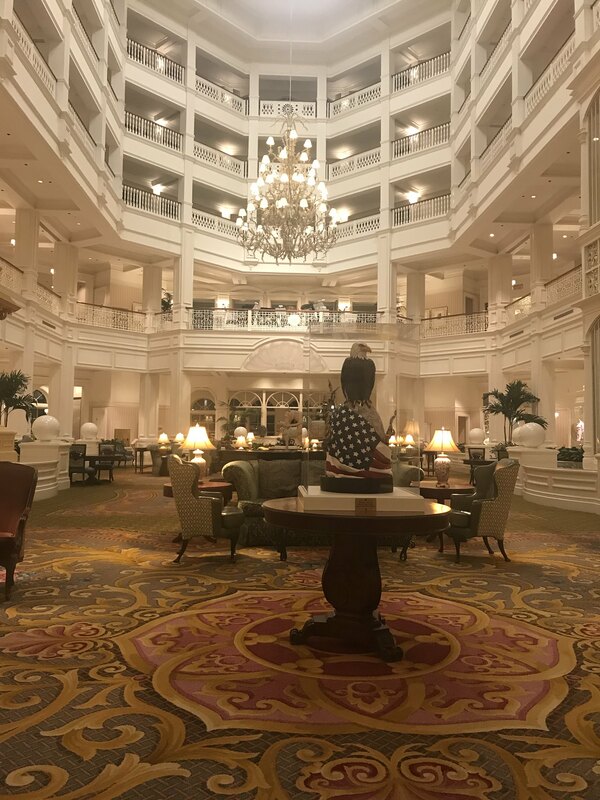 It was eerily quiet as I walked through the lobby. I was the only guest lumbering around and there was only one CM working the reception desk. We said hello to each other and I sat down and watched my Lyft app as the driver was getting closer to the Grand. 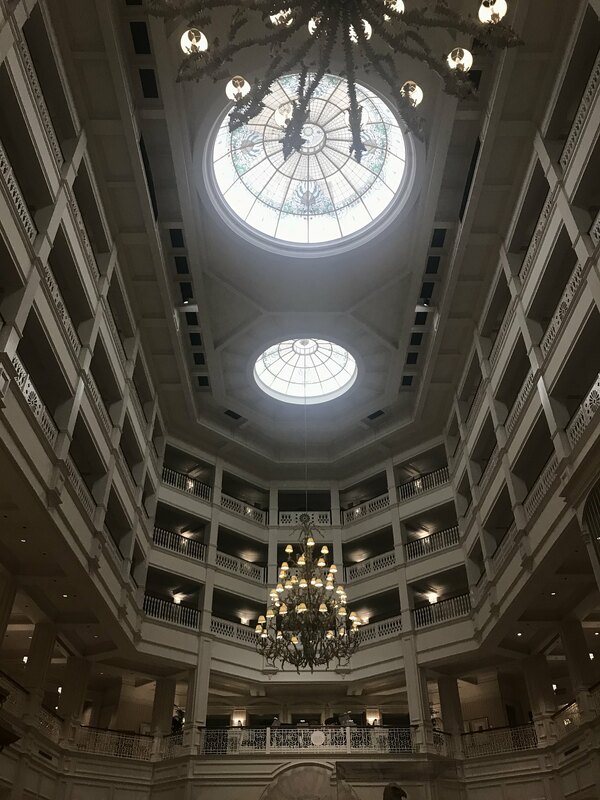 I was able to take a few final photos of the lobby and reflected on how fortunate I was to have an extended stay at such an amazing resort. With that, my phone notified me that my ride had arrived so out I went to meet her. My driver was very friendly, even for four in the morning, as she opened the trunk to allow me to stow my bags. I hopped in the car and off we went. 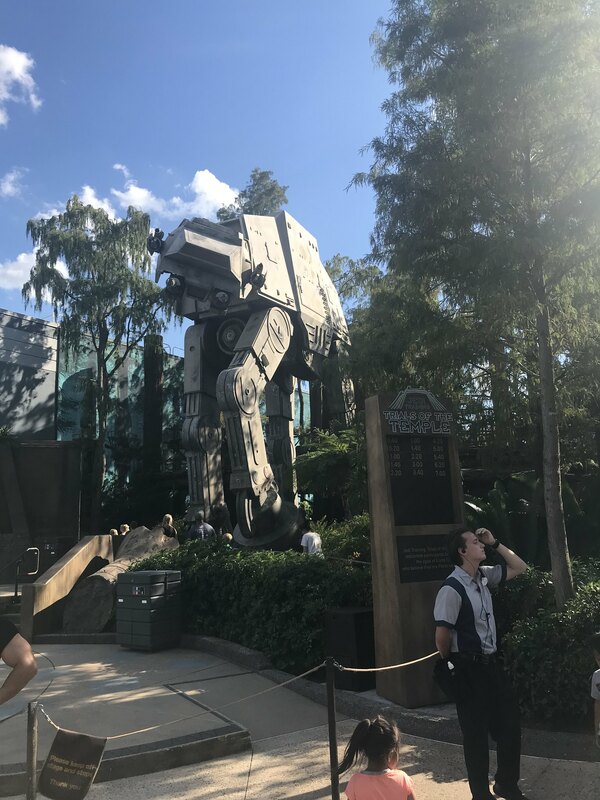 I was quite pleased I opted for a later ride but after seeing how dead the roads were upon leaving WDW, I was kicking myself for not sleeping for another hour. Oh well. I had no issue arriving at the airport, getting through security and simply waiting to get home. The drive to the airport was super smooth and quick. I thanked my driver and made sure to give her a nice tip through the app. I appreciated that she was willing to pick me up so early and get me where I needed to go. The airport was a little busier than the roads but from the ticket gate to security, to hopping on the tram to head to the terminal, I was sitting at my gate in less than 30 minutes. I loved every second of this trip but I was so ready to get home and see Kelly and the kids. Both flights, the first to Toronto and the second to Edmonton, were as easy as I could have hoped for and eventually I had touched down back home in Edmonton. As we broke the cloud cover to land I could see that the ground was somewhat covered in snow. For mid-September, this was not a welcome sight. Kelly did send me a few photos during the trip to warn me that we’d been having some unseasonable weather but I went from absolute perfection to snow on the ground in a matter of hours. After grabbing my luggage, heading back to my car and making the drive home, I came through the back door to be greeted by all the girls. It was so nice to be home, even with the chilly, gloomy weather. And that’s where my reports come to an end. I loved being able to relive both of these very different trips and I most certainly appreciate everyone who has stuck it out, followed along, commented and shared in our adventures. 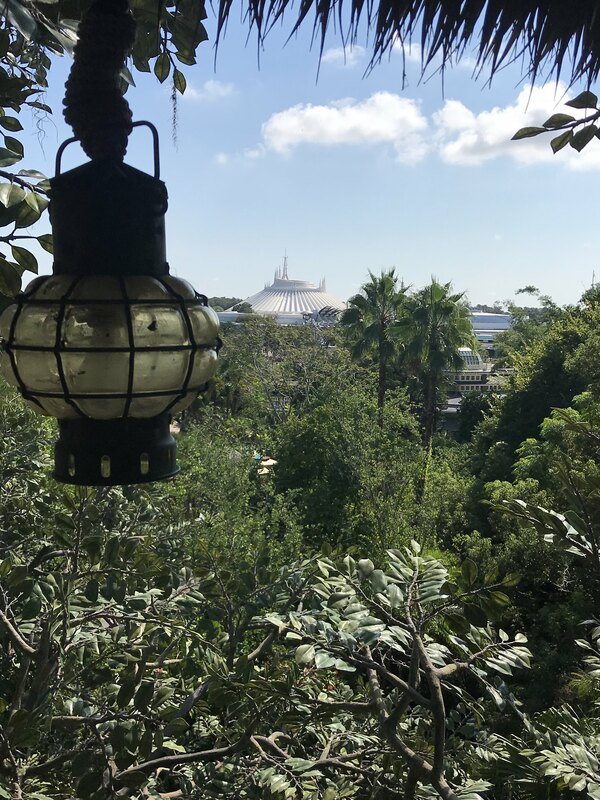 Kelly and I love being able to share our trips with you and we love having the opportunity to live vicariously through you as well as we read your reports to get our WDW fix. At this point in time, we have no firm plans to head back but I am working towards running the half marathon in January of 2020. If all goes to plan just Kelly and I will be making that trip and it will only be a few days long, but it would be another very cool experience that I hope we are able to live out. We are giving Hawaii another go and will be staying at Aulani from April 6-14 so we may have to create a trip report for that visit whenever we're back. Fingers crossed this one works out better than last year! Thank you again and I will post some closing thoughts in the coming days! I very much enjoyed both parts of your report - thanks for sharing! Would love to read a trip report of Aulani! Thanks so much for reading. It was fun to write! My Saints were robbed! My husband and I are still depressed! So heartbreaking! Would have been great to see a Brees vs. Brady match! AGREE,May have been nice to see DB getting a bit of hard earned glory, for a change. Thanks for sharing both trips!! They were very enjoyable reads & your family is lovely. our session was only for 4 hours or so. What you got to do is really cool!! Your reports are lots of fun and so well written, they are always a pleasure to read. Thanks for sharing your adventures with us! I hope your toiletries stash holds out until your next visit. Thanks for reading and for the kind words. I totally agree I was very fortunate to be able to attend. I have no doubt there will be some Disney influence around the workplace moving forward and with any luck maybe I'll find my way back to another DI session sometime. Thanks for reading and for the kinds word as well! If I wasn't able to secure that grant I would have been on the outside looking in. With the exchange rate, I thought there would be no chance to attend but things fell into place nicely. 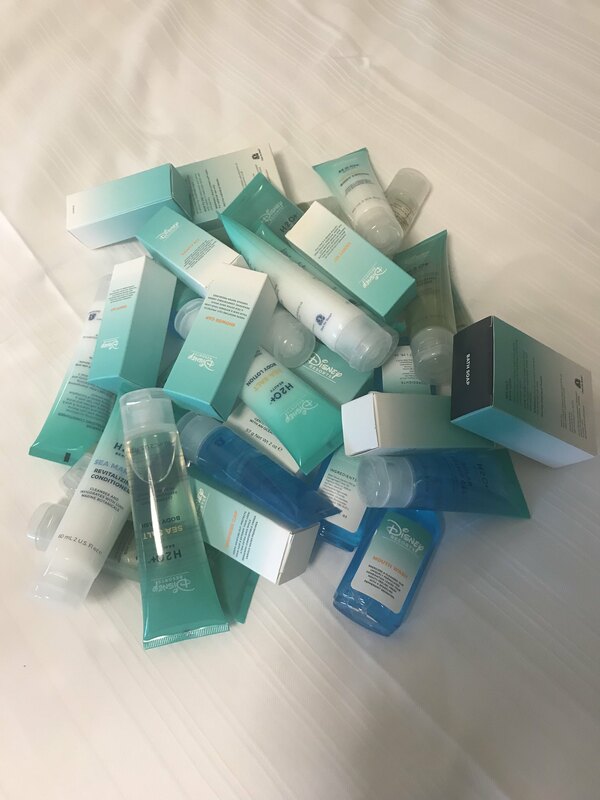 As for the toiletries, assuming Aulani has a similar setup, I'll be stashing as much as I can! Thanks for writing such a fun and informative double TR! Felt like it took forever but it was a lot of fun! Thanks for reading and it was great to bump into you during the trip! Loved hearing about your trips and I would definitely be interested in an Aulani report! noooooooooooooooo this can't be the end!!!!!!! Thank you for sharing both trips and I look forward to hearing about the Aulani Trip! Thanks very much! Looks like we will definitely be doing an Aulani review. I'm hoping the runDisney event comes together as well. I'm trying my best to get myself ready for it and from everything I've read about the runs, it sounds like a great time. Thanks so much for following along! Stay tuned for an Aulani version. Great Report Matt. I loved both parts. I'm really looking forward to your thoughts and adventures (even if laid back) at Aulani! Thanks for reading, John. I’m looking forward to sharing our Hawaiian adventure as well!